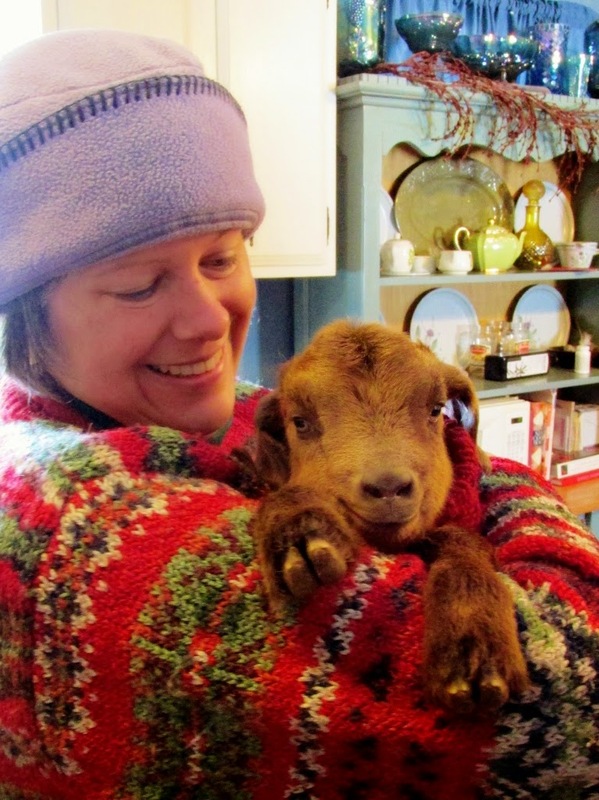 We had a nice visit planned with some wonderful friends to meet our new baby goats this morning. Levi smiles all the time. His personality is starting to develop. Stephanie: I would love to see goats kidding sometime. I have never seen it in real life and I think it would be interesting. At that moment, Sean walks in carrying Levi and Sarah. Sean says, "You know how you were writing about how unpredictable our life can be? Jane is in active labor." Sonja: How active? Is she just starting labor or is she ready to kid? Sean: She has a bubble. We need to get out there now. Sonja: Well, I can't believe your timing, Stephanie. I guess you might get to see a kidding today. I don't mind you coming out to watch, but you need to be prepared. Sometimes there is not a happy ending. Jane has kidded twice for us. 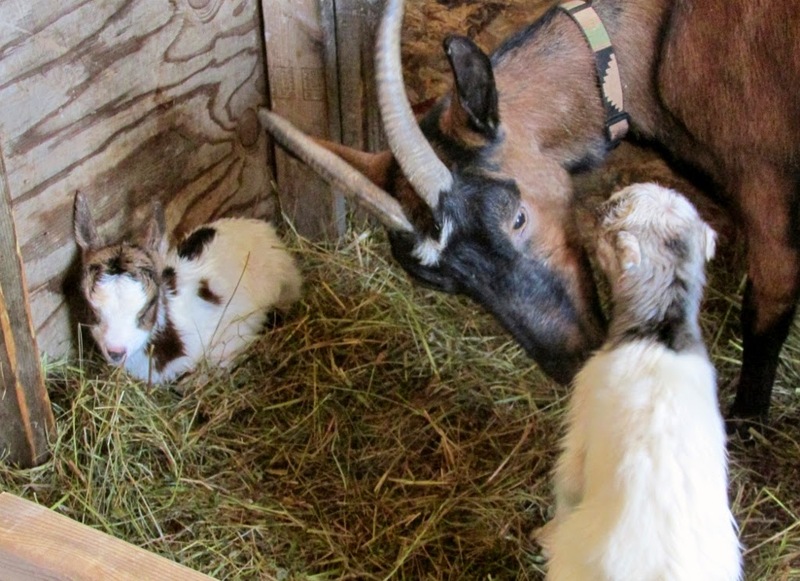 Both times she had twins; a buck who lived and a doe who was stillborn. Sometimes there are complications and we could lose a doe. I just want you to understand that it is not always joyful, though we hope so. Stephanie: I would like to come out. Sean: Well, we better get out there or we might all miss it! but Jane does! She eats with a great appetite between contractions. For those of you who are new to our homestead, Jane is a French Alpine doe who must live either alone or with the bucks. She does not tolerate does and killed one of our goats when she first arrived two years ago. In the field, she is fine. But, she cannot be trusted inside the barn with any of the does. We are often asked, "Why not put her down or give her away?" The answer is complex. First, she is a great "people" goat. She is very well mannered walking on a leash and loves being near us. Jane is a fantastic mother. She kids easily and cares for her offspring very well. And, she is one of our highest milk producers. Besides, it is not her fault that she thinks she is a dog and not a goat. If she were a danger to the people, there would be no question that we would make the tough decision. That is not the case. 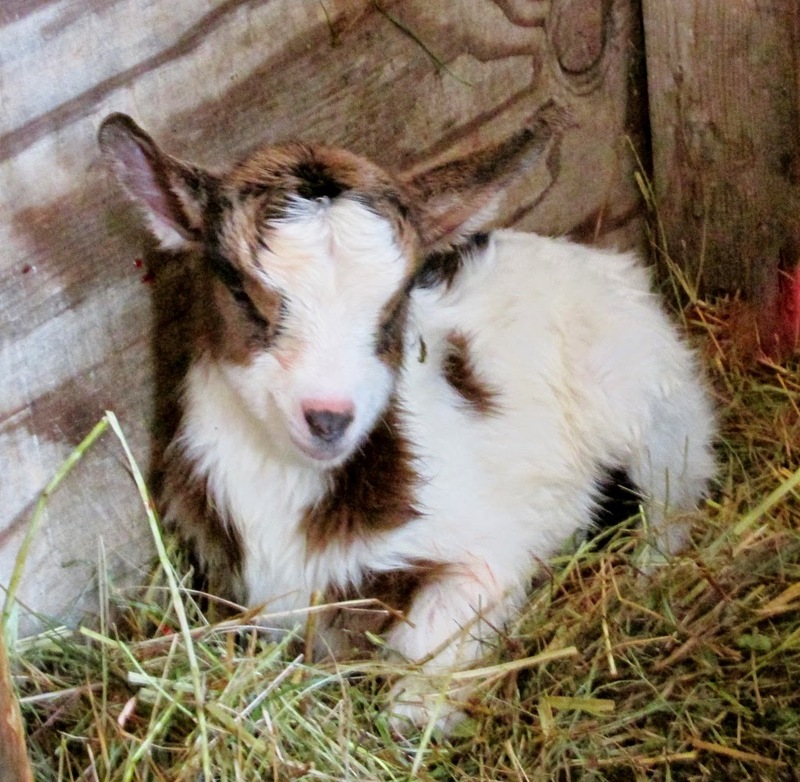 The option of selling her or rehoming would only be passing on a "special needs" goat to someone else to deal with and there is no guarantee that they would be willing to work with her the way we do. We have learned that accommodations can be made to work within her abilities and so, she lives with the bucks. They rough-house, but no one gets hurt. The only draw back to our arrangement is that Jane is bred every year instead of every other year and she kids at unpredictable times. We all made it to the barn in time to assist or watch the kidding with about 20 minutes to spare. Jane's kidding was routine. It took longer this time than in the past for Jane to deliver the head and body of the first kid, but once she got down to business, we had two healthy kids within an hour. 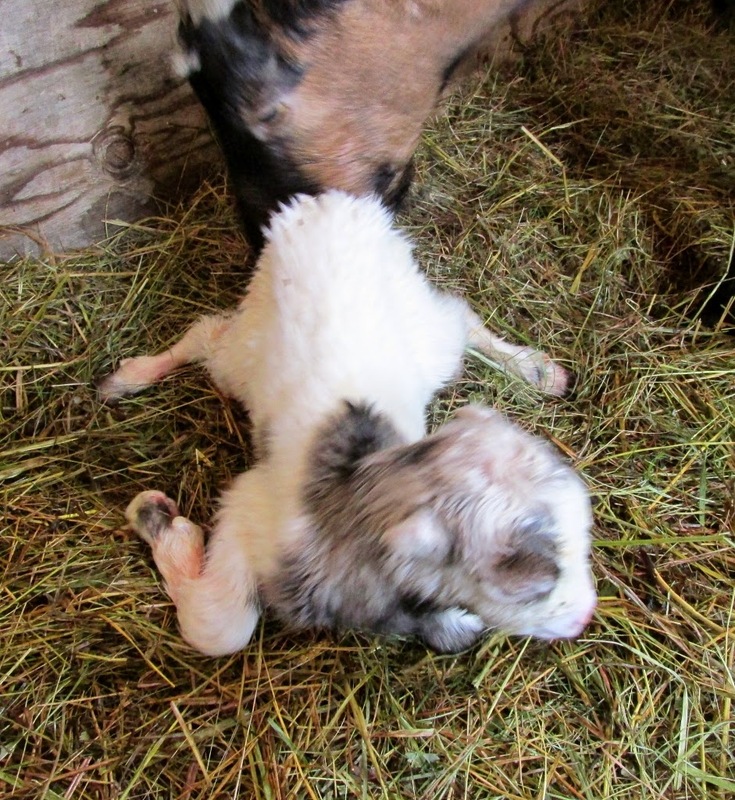 Jane's first kid was a 5 pound doe, speckled with spots and sporting her mother's ears. We named her Phoebe. It is still amazing to meet each new kid and see its unique personality shine through. Phoebe stood within minutes of being born and headed straight for her Momma's milk as if she had done this many times before. 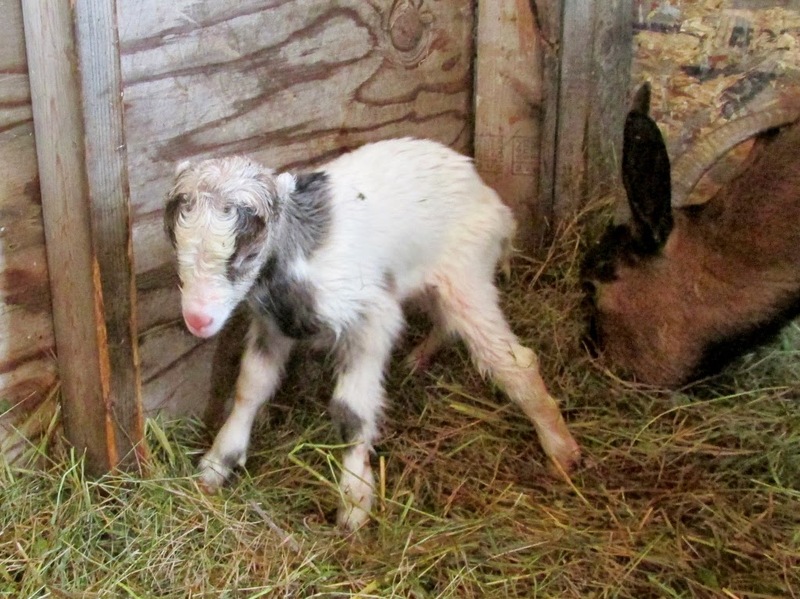 Ezekiel was born a few minutes later, a wiggling 6 pound bundle of grey and white splotched fur with elf style Lamancha ears. Over the course of the next hour, Zeke stood and fell dozens of times trying to figure out his feet. He is a terrible cry-baby. Every time we pick him up or helped towel him off, he fusses up a storm at us, calling for his Momma. We are going to have to really work with him to get him used to people. Zeke's first shaky attempts to stand. He is all legs and more often than not, those legs were interested in going in four separate directions! I am so relieved that both of Jane's kids survived this year and that both Momma and kids are healthy, alert, and normal. I could wish that Jane had not selected the coldest night on record in 20 years in which to kid, though. I have written before of the frigid cold that we are dealing with this year. 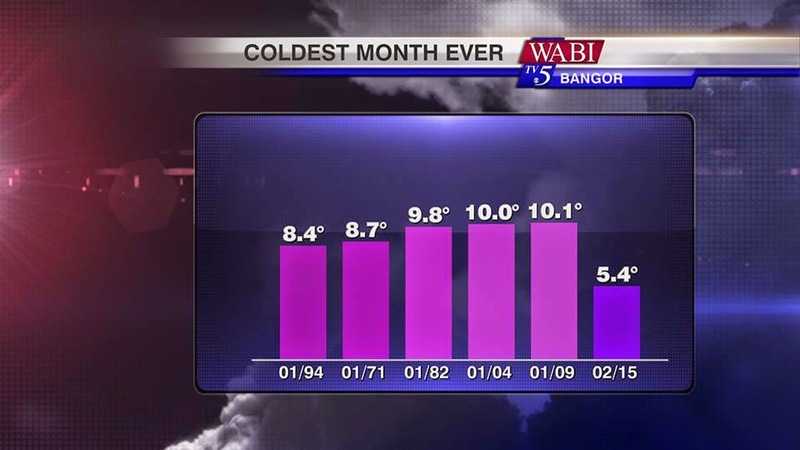 I looked up the stats and it appears that this month of February will go on record as the coldest month ever. (It says so on the chart. ;) ) Add to that the significant and unrelenting deluge of snowfall and you can understand how miserable the weather has been for us. Our barn is usually 20 degrees warmer than the outside air in the winter time and much cooler than the outside during the summer months thanks to windows and doors to provide a nice cross breeze. 20 degrees warmer when the weather dips to 0 means the barn is still 20 degrees. With their thick winter coats, full bellies, plenty of fresh water, no drafts in the barn and deep litter composting under foot, the animals handle that kind of cold in stride. Last night, the thermometer read -1 degrees at 11 pm inside the barn. Outside was forecast to drop to -22 with a windchill making it feel like -45 degrees. I am not even joking. This would be alarming for our animals without two kids less than a day old thrown into the mix. More decisions to consider. We could bring the kids inside and risk Momma Jane rejecting them. We could allow a full sized goat, complete with bloody "show" dripping from her tail end, inside our home with her kids. 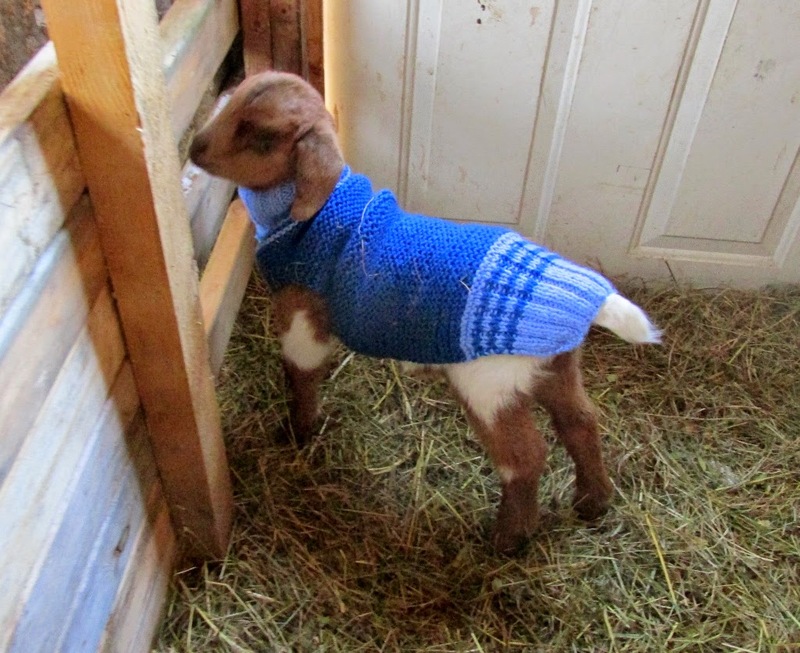 We could sweater the babies and add more hay. We could bring out a space heater and take the risk of a fire. Options, for sure, but which one would be the best for us? In the afternoon when I saw the forecast, Sean and I started to prepare. We sweatered the newest kids. Any possible draft was found and stuffed with hay. We heated the granite stone on the wood stove. Sean added extra bedding. I experimented with making some sacks that could be warmed in the microwave. The winner was three small sacks half-filled with the rice or dried kidney beans we had on hand. I twisted the middle closed around the rice or beans and secured it tightly with an elastic band. Then, to be extra safe, I inverted the rest of the sack around the part holding the rice, so a curious goat would not be able to open it and eat the contents. I tested the make-shift warmers. Sacks warmed for 4 minutes in the microwave kept warm for just about 90 minutes in the barn. Used in conjunction with the heated stone, we could keep one sack near each set of kids all the time, rotating them out every 90 minutes. At 1 am, the temperature inside the barn dropped to -7 degrees. We decided to use our portable electric space heater. We own a long cylinder-style one with ceramic coils covered with a protective grate. It shuts off automatically when it is jostled or turned on its side. Sean used heavy duty 4 inch screws to mount it to the underside of the ceiling joists at an angle to radiate towards the floor. Then, he used wire to secure it further on either end. We know heat rises, but there was no way to attach it safely near the floor or on the wall. 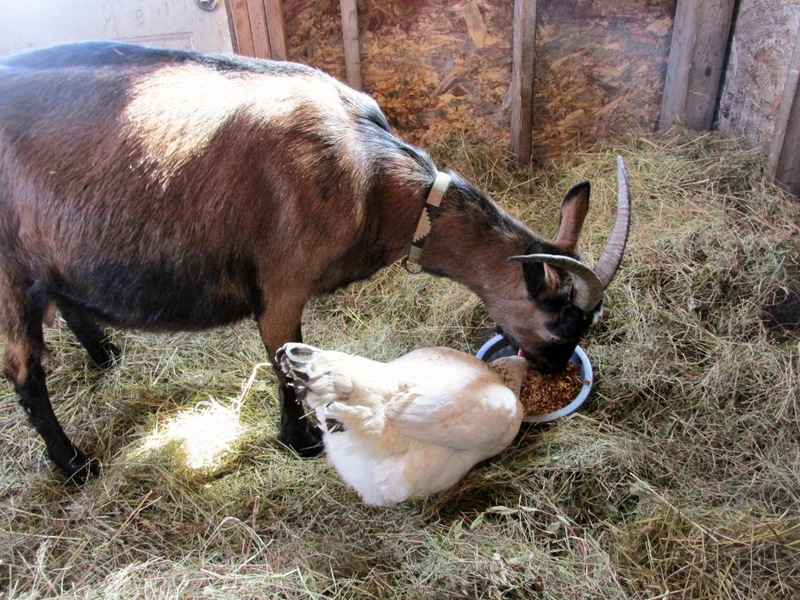 With chickens roaming freely in the barn, they could try to roost on it and get injured. This was the best solution for us. And, it worked in that the barn temperature was raised to 20 degrees by 3:30 am. The draw back to our solution was the inability for us to sleep until nearly morning. We had to monitor the portable heater and replace warmed rice packs all.. night... long. And, by we, I mean mostly Sean. I confess, I dozed off a couple times, but I can assure you, I was not rested one bit! was not interested in that! Still, it was all worth it. We lost no one to the brutal cold. 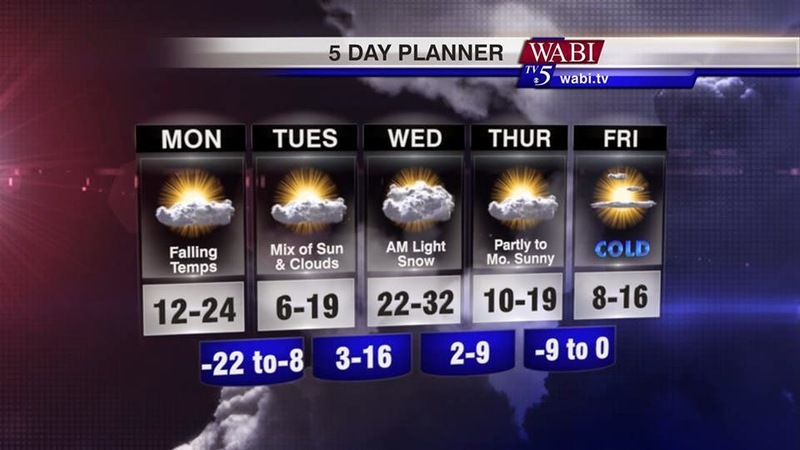 According to the weather predictions, we'll have a bit of a break and then, are in for another freezing overnight Friday night into Saturday, though it is supposed to be warmer than this last one. We'll monitor things and take the precautions that seem the best to us. That is all we can do. Our best effort. More images and video to come in the days ahead. Stay tuned, friends. Wonderful birthing story Sonja! And I loved the pictures, the babies are so cute! I was interested to hear how you kept the babies warm overnight. It sounds exhausting but well worth it. I used the rice in a sock trick once we received a surprise box of chicks. It kept the warm while my husband went out to buy a bulb for the heating lamp.